Pick-up from Kilimanjaro airport by one of our drivers; 2 hours journey to your accommodation in Momella. You have the opportunity to visit the projects of Africa Amini Alama – see for yourself how every dollar you spend during your trip is used to support people in our various social, educational and medical projects. Visit the hospital, the orphanage and the primary school as well as vocational schools. By the way, our Africa Amini boss Christine Wallner is a true lioness herself and you will probably meet her several times that day. Today you should meet the real LION KING – four hours drive to the Tarangire National Park with our driver. By jeep the game drive begins and you cross elephant herds and all the animals that live in Africa. You will probably meet the lion king and his family already today. On the way you will see some of the legendary African Baobab trees where Simba’s companion “Rafiki“, the Mandrill, lives. Early morning departure to Serengeti National Park. All three big cats can be seen there: Cheetahs, leopards and lions inhabit this area. You may also be able to observe them hunting. Enjoy a full day game drive through the Serengeti – watch out for the footsteps of the lion king and let it remind you of young Simba putting his paw in his father’s footprint. Early morning departure to Ngorongoro Crater. This crater is the largest inactive, unbroken and unfilled volcanic basin in the world. It is one of the best places to see the endangered black maned lion “Scar”, Simba’s uncle. Today you have time to relax at the pool and enjoy the view of Kilimanjaro at the Original Maasai Lodge. The Lion King has included this mountain in his mythology by mentioning it in the song “The Circle of Life”. Experience a special Maasai day: Get to know the culture and rituals of the Maasai, visit an original Maasai boma (hut), try spear throwing and enjoy the sunset while remembering your adventures. After breakfast and checking out, you will be taken either for your flight to the airport or to a pre-arranged meeting point for your onward journey. $5,590 for two people; There is no surcharge for single occupancy on this special trip! Everything mentioned is included in the price. All components of the itinerary as well as activities from other packages can be adapted to your personal needs. Please let us know any changes you would like to make and we will create your individual tour. Our driver will pick you up at Kilimanjaro airport; 2 hours journey to your accommodation in Momella. Start your day with a healthy breakfast, because sporting challenges await you: Hop on your mountain bike and follow us on a tour through Momella to experience the different projects of Africa Amini Alama. Our local projects include a hospital, an orphanage, a woman’s tailoring group, an English primary school, a computer class and vocational schools. Take a break and enjoy a tasty lunch under the Africa Amini sycamore fig tree. Continue your bike tour along the river to Ngare Nanyuki to enjoy the beautiful sunset at a special place. Your view touches the Momella lakes and the fascinating natural landscape of the Arusha National Park. The island in the middle of the lake is the breeding ground of the python snakes, which you can sometimes encounter here. At nightfall we will take you back to your home in Momella. The Arusha National Park consists of mystic rainforests with a beautiful flora and fauna. However, you will have to make the effort to track down the animals both on foot and in a canoe. A ranger will accompany you and show you the black and white Calabash monkeys hidden in the treetops. Giraffes, antelopes, zebras and buffalos cross your paths and with a bit of luck elephants can also be spotted in the dense bush. Today you can feel like a Maasai for whom a four-hour walk is part of their daily routine. You will hike through several vegetation zones, cross villages and with the help of our guide, you will be able to communicate with locals and be invited into their homes. Finally, very tired, you will be greeted with cheers by the Guard of Honour at the Original Maasai Lodge. Now you are part of them. Here you will be well cared for, from the food to the sauna and the swimming pool, you can now listen to your body again. Your soul is nourished by the unique spectacle of the thousand hills that you can observe in our Mirror Cave. At the campfire you listen to the exciting stories of the Maasai and the amazement of this special culture will accompany you to the following dinner. Today you can apply your sporting skills in different ways: You have already experienced cycling and hiking. But have you ever ridden into the savannah with a wild donkey? Maybe you’ll manage it, but we can’t guarantee it. In any case, you will be rewarded for your efforts at a fantastic viewpoint. Don’t worry, there’s always food in this challenging landscape! Also in the evening you should not rest, but dance with the Maasai. The more you participate, the wilder the songs and the dances will become. The scenery of this happening depicts Mount Meru in the setting sun and the highest mountain of Africa, the Kilimanjaro, which now sinks into red clouds. On the last day, it is up to you to see and experience all the things for which there hasn’t been enough time before. For your onward journey you will be taken safely to your next meeting point. Our driver will pick you up at Kilimanjaro airport; 2.5 hours journey through untouched wild Maasai area to your accommodation. The Maasai welcome you in their very special, impressive way. Let us introduce you to the life of the Maasai at this ancient, mystical cultural site. Nothing is as you are used to it. You will live in clay houses with some additional amenities such as an English toilet, a shower and a sink. The large pool and the sauna also a portrayal of what you would expect from a luxury lodge. Already our Mirror Cave takes you into the African dream world. While trying to shoot a target with your own spear, your senses will be taken into old adventures and fantasies of killing a lion. At the campfire you learn everything about the Maasai culture and are invited to ask many questions. In the evening a dinner will be served that normally only Maasai eat. After breakfast you will discover the medicinal plants of Maasai medicine with a naturopathic guide. On this walk you will have the opportunity to learn everything about the Maasai culture from your guide, gaining a deep insight into the everyday life of the people. Now at the latest you will understand what an original boma looks like and you will be happy to return to your own boma. After lunch, you will have the opportunity to try on the traditional Maasai clothes yourself and to attach the traditional buckets to your donkey in order to get water. For the Maasai this is a very funny sight. You will enjoy your next glass of water with great gratitude. Your journey with the Maasai begins in the afternoon. We supply you with a used tyre, cassava, corn, sweet potato, milk powder, tea, enough water for three days, a sleeping bag and a mat as well as sun protection. This time the Maasai will pack your donkey and you will be released into the wilderness. On the way you will meet your own herd and a Maasai child will help you to get them to their destination with whistling sounds. Learn to make a fire without matches and cook your own food. You will sleep outside under the stars while a Maasai warrior watches over you. After breakfast you can experience the adventures of self-sufficiency again and then drive your herd further. At the next stop you will make shoes from old tyres, collect roots and herbs and make the traditional Maasai soup. To have a roof over your head, food in your stomach and a good sleep, you will have to endure a lot. You can learn how to slaughter your own goat and invite people from the surrounding area to a feast. Also potatoes and roots will be served. Now you have truly earned a roof over your head in a typical Maasai boma. After returning from the wilderness, the day is completely reserved for you and your personal well-being. Enjoy a day at the Original Maasai Lodge. Now you can finally enjoy the swimming pool, sauna, massage (extra charge) and the wonderful view. In the afternoon you can meet the founder of Africa Amini Alama, DDr. Christine Wallner or her daughter Dr. Cornelia Wallner-Frisee. She will tell you about the construction of the lodge together with the local Maasai women and exchange experiences with you. If you wish, your day can begin with coffee or tea while the sun is rising behind Kilimanjaro. 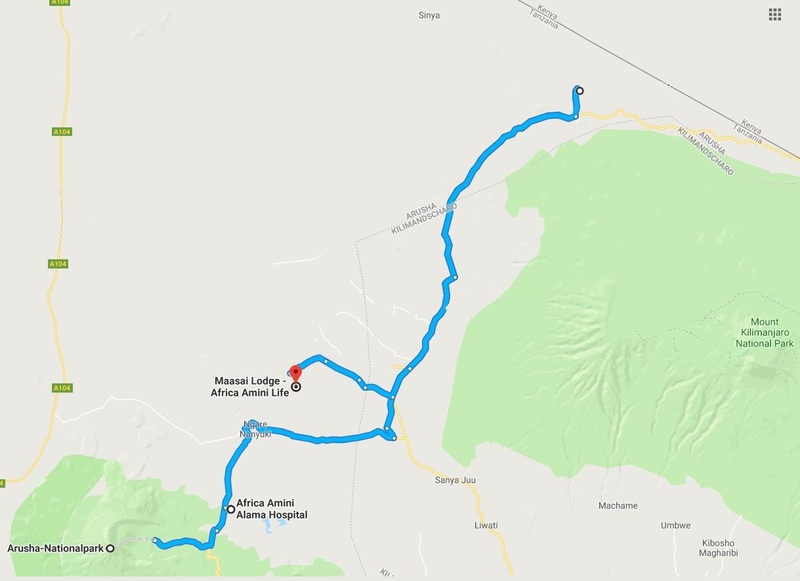 Today you drive to the Meru area at the foot of Mount Meru, next to the Arusha National Park. Enjoy a typical African lunch in the local restaurant in the shade of our characteristic sycamore fig tree. You may have a look around the projects of Africa Amini Alama. Afterwards a wellness afternoon with naturopathic treatments awaits you. A relaxed dinner with your Watchman will conclude the day and prepare you for your next experience. Now you take over the task of your Watchman and protect at night what you have seen during the day. Overnight stay: Momella – choose between Hillside Retreat or Nature Homes (half board). Enjoy your breakfast and remember all your adventures. After checking out, you will be taken either to the airport for your onward flight or to a pre-arranged meeting point for your onward journey. After your arrival there will be enough time to acclimatise and feel what it is like to be at 1600 meters altitude between Mount Meru and Kilimanjaro. Depending on your condition, you can make your first explorations of the village and its surroundings. Your guide will accompany you wherever you feel like going. A cozy dinner will round off your day. Today’s the day! After a rich breakfast you will realize that all roads lead to the project of Africa Amini Alama. Whether you ask children or adults – all the people in the area will know how to take you to the hospital. This is the focal point of our charitable organization, where you can also get to know the restaurant, the orphanage and the tailoring. Children you meet will be happy to show you around, but of course your guide is also available. Take a look at everything you want to see. The fixed point is a meal under the famous tree in front of the restaurant: a tree with a span of more than 30 metres and of the sycamore family. Legend relates that the atmosphere in the area of 20 km is purified by this tree. After lunch at the latest, you will have recharged your batteries from this tree. Now fasten your backpack and put on your mountain boots. We are climbing up Mt. Mukuru. It is 800 meters to the summit but you will have the feeling that you have already scaled Kilimanjaro. Mukuru is the holy mountain of the Maasai and only Africa Amini visitors are allowed to go up. Enjoy the sunset and the solitude of this holy place. In Arusha National Park you will find the famous black and white Calabash monkeys. The park is known for its rainforest and viewpoints. The wildlife does not show up on open plains, but you will find it on the game drive. Buffalos, zebras, warthogs, giraffes and flamingos will be encountered. The Ngorongoro Crater and the Momella Natron Lakes will complete your nature experience. Whenever you are hungry, your guide will find a nice place for your picnic. You will be awakened early to leave for Sinya Wildlife Sanctuary. Once there, you can leave the car during the whole tour and explore the nature on small trips that you decide for yourself. 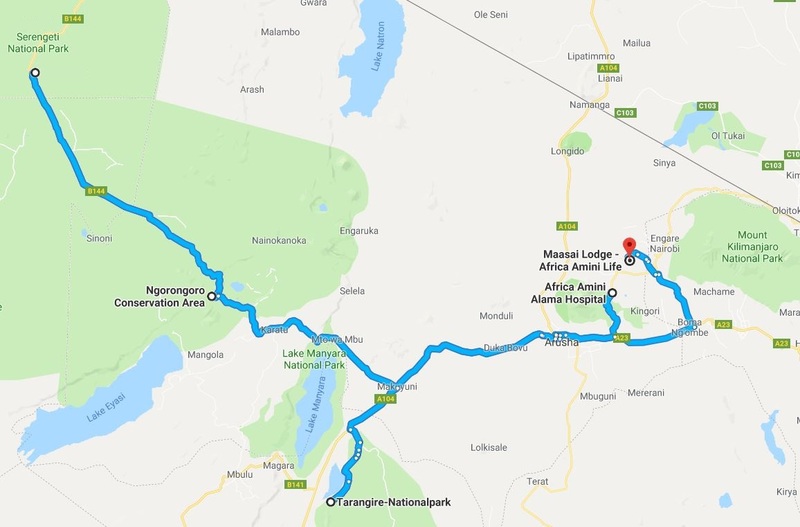 You come close to the Amboseli Elephant National Park – flooded hills and acacia forests as well as a spectacular view of Kilimanjaro are waiting to be explored. Depending on your luck, you may spot gnus, kudus, gerenuks and oryx antelopes – animals you can’t see in all national parks. You will spend the night in the wilderness and help to set up your night camp. Your cook will prepare a tasty meal in the bush and you will end your nature experience with a campfire. Today we arrive at the most spectacular lodge in the area, the Original Maasai Lodge. Built by Maasai women, you will be amazed to find that the clay hut also has room for an English toilet, a shower and a sink. You will enjoy falling onto your bed overlooking Kilimanjaro. Go swimming, visit the sauna and get a massage (surcharge) or simply gaze at the thousand hills in the Mirror Cave. Our small organic plantation provides a healthy lunch and you can find all the herbs from the permaculture project around the lodge. The Maasai will delight you with their songs and fighting techniques – sing along, dance along and fight along, or simply let all your impressions sink in silently and calmly. You will certainly not remain unimpressed today. At the campfire you can talk to the locals and learn more about the everyday life of the Maasai and their culture. Early in the morning, you will be taken on a quiet walk through the African savannah with a Maasai herbalist. He will introduce you to Maasai medicinal plants and herbs that are still used for various purposes today. After a two-hour walk you will return to the lodge for breakfast. You will then be taken to the airport for your onward flight or to a pre-arranged meeting point for your onward journey.